NoviFlow switches implement the next generation networking technology – a programmable forwarding plane with match+action rules in a fully programmable pipeline. 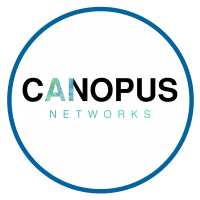 This new networking paradigm has huge implications for utilizing SDN forwarding planes to provide both telemetry and a real-time mitigation channel to AI-Based Bandwidth Optimization services such as Canopus Network’s Comet Software. With the arrival of digital media, ubiquitous mobile devices and the rise of streaming video services, volumes of traffic are increasing exponentially. In many cases, the percentage of evening network traffic represented by video services has risen to over 60% of the total. Despite being essentially “inert” data, this traffic is producing massive amounts of network flows in order to get telemetry, monitor usage and analyze traffic, and worse still is driving the cost of Packer Broker and Network Security services through the roof. Network operators’ would love to be able to simply bypass cybersecurity for such known-safe traffic, but a large and increasing portion of this traffic is both obfuscated and encrypted, making it nearly impossible to identify using simple packet inspection methodologies. 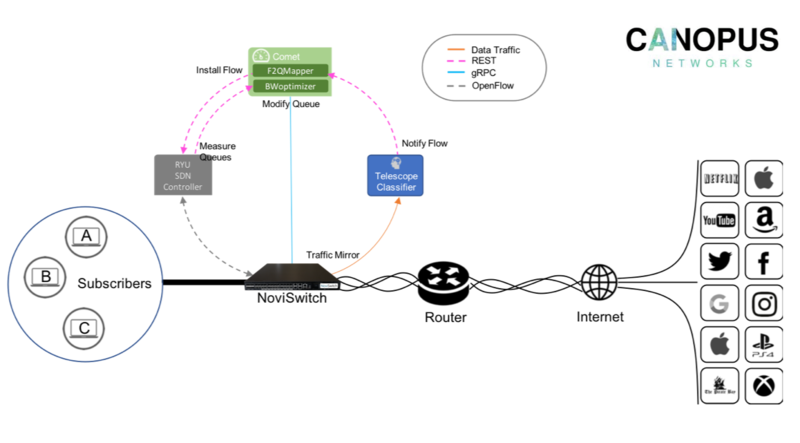 The NoviFlow-Canopus Joint solution leverages NoviFlow’s CyberMapper and Canopus’ Comet software which isolates and manages traffic flows into dynamically configured queues to reduce bandwidth requirements and improve user experience at the same time. Comet utilizes AI based flow classification from Telescope and implements policy-based traffic optimization in real time.